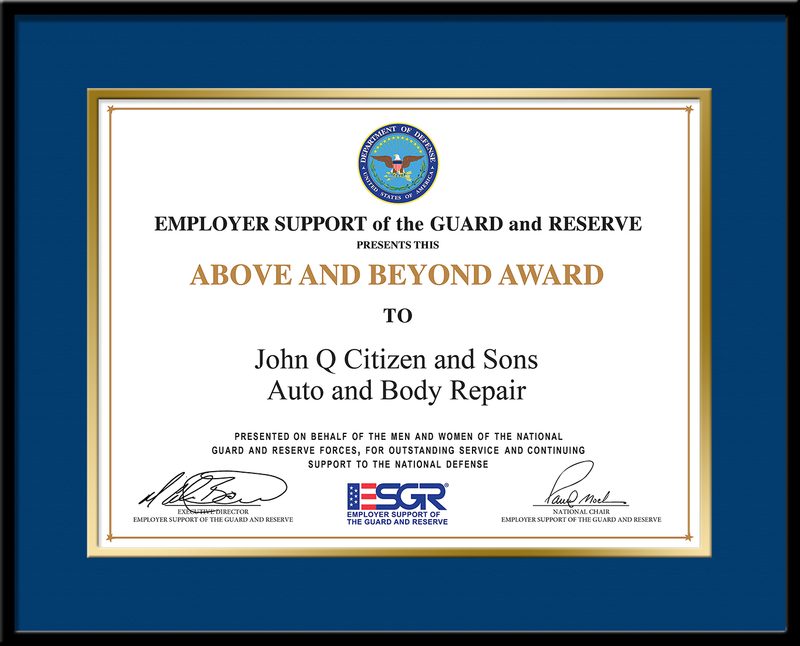 The Above and Beyond Award is presented by ESGR State Committees to recognize employers at the local level who have gone above and beyond the legal requirements of the Uniformed Services Employment and Reemployment Rights Act by providing their Guard and Reserve employees additional, non-mandated benefits such as differential or full pay to offset lost wages, extended health benefits, and other similar benefits. The award is given in limited numbers by State Committees to employers who have had at least one of their supervisors/managers recognized with a Patriot Award, and who have signed or agree to sign an ESGR Statement of Support. State Committees are authorized maximum discretion in considering an Above and Beyond Award for Patriot Award nominations of smaller firms, those with no individual supervisors specified, and other similar situations.